Rhizomes are thick, horizontal, stout underground stems. They are swollen with the storage of food stuffs. They contain nodes and internodes. The nodes contain brown scaly leaves that protect the axillary buds. Nodes bear adventitious roots on the lower side. At onset of favorable situation the axillary and terminal buds grow into aerial shoots. Such aerial shoots die on the approach of unfavorable situation. 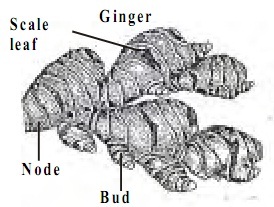 Example: Ginger, Turmeric etc. Rhizomes are excellent means of perennation. They aid to tide over the unfavorable conditions such as drought and so on. They serve as store houses of food that is safely protected from the grazing of cattle. As aerial shoots occur from the buds of the rhizome they are helpful in vegetative propagation too. Tutors, at the www.tutorsglobe.com, take pledge to provide full satisfaction and assurance in Plant Morphology homework help via online tutoring. Students are getting 100% satisfaction by online tutors across the globe. Here you can get homework help for Plant Morphology, project ideas and tutorials. We provide email based Plant Morphology homework help. You can join us to ask queries 24x7 with live, experienced and qualified online tutors specialized in Plant Morphology. Through Online Tutoring, you would be able to complete your homework or assignments at your home. Tutors at the TutorsGlobe are committed to provide the best quality online tutoring assistance for Biology homework help and assignment help services. They use their experience, as they have solved thousands of the Biology assignments, which may help you to solve your complex issues of Plant Morphology. TutorsGlobe assure for the best quality compliance to your homework. Compromise with quality is not in our dictionary. If we feel that we are not able to provide the homework help as per the deadline or given instruction by the student, we refund the money of the student without any delay.